These fragrant spice blends harness the globe's greatest flavors. Maybe it's the scent of sweet curry powder that transports you to Amma's Indian table. Or maybe a whiff of the Chinese five spice takes you back to that amazing food court in Flushing, one of New York's fastest-growing Chinatowns. 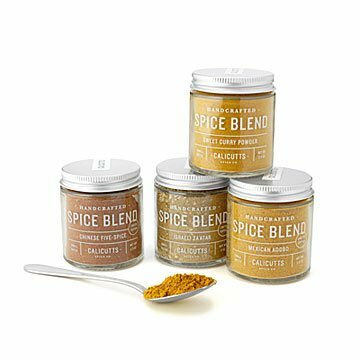 Wherever you have (or haven't) been, these fragrant spice blends are sure to move you. Each pays tribute to a different nation, from Israel—where za'atar adds earthy tartness to flatbreads—to sunny Mexico. The set makes a great gift for globetrotting gourmets. Hand-blended in Hershey, Pennsylvania, where chocolate's not the only thing that's tasty.